If you ever notice various pop-ups, deals, coupons, and other kinds of advertisements appearing on your screen, you should check whether Bomlabio has not infected your system. This program is known to be the newest product of SuperWeb LLC; thus, you should not expect anything beneficial from it. It has been found out that Bomlabio acts very similarly to other applications published by the same company, for example, Fortunitas, Yula, and Surftatic; thus, if you have ever encountered any of these programs, you will definitely know how Bomlabio is going to act. We do not recommend trusting this software because it might not only annoy you, but also cause you security-related problems. 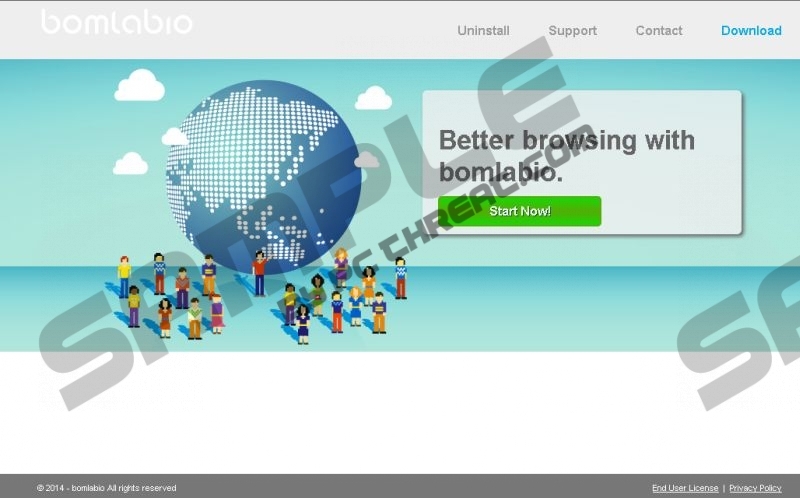 As plenty of adware programs, Bomlabio might enter your system rather secretly because it tends to be distributed with a help of various additional programs. If you tend to skip the installation steps by clicking the Next button, it is not surprising that an unwanted program has entered your system. In order to avoid undesirable software in the future, keep in mind that it is very important to select Custom or Advanced installation options and complete the installation of new programs with a great care. If you do so, you will soon notice that the amount of unfamiliar software residing on your PC has been reduced. The most disturbing fact regarding Bomlabio adware is the observation that it might cause you security related problems. If you wonder how it is possible, you should know that not all the links embedded in advertisements are reliable, which mean that you might be taken to corrupted websites after clicking on them. As we care about the security of your system, we recommend ignoring all those ads. Of course, it is also extremely important to delete the program itself because you might click on those commercials accidentally. If you want to get rid of Bomlabio easily and quickly, you should definitely use the instructions provided below the article. However, keep in mind that you can also use an antimalware tool, for instance, SpyHunter. As there are plenty of tools published, make sure that you select a reliable one because only such a tool will be able to remove different kinds of threats hiding on your system and protect your system from future infections. Type in Control Panel after RUN launches. Right-click on Bomlabio and then delete it. Quick & tested solution for Bomlabio removal.